Here is another engaging release from Brilliant Classics' current series of CPE Bach recordings - recordings that celebrate the genius of a composer who was, on account of his harmonic language, preoccupation with improvisation and cultivation of the empfindsamer Stil, undoubtedly the most strikingly individual talent among Johann Sebastian Bach's sons. Central to Carl Philipp Emanuel's output was the clavier, with the composer writing more than 50 concertos for this instrument - an astounding number considering how new a genre the keyboard concerto still was at the time. A small number of which are detailed on this disc. 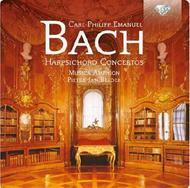 While J S Bach is usually credited with elevating the harpsichord from its traditional role to a solo concerto instrument, his harpsichord concertos are almost certainly arrangements of earlier compositions for oboe, violin etc, and Carl Philipp Emanuel's collection therefore stands as the first important one of its kind. The works indeed number among the finest of their time, their quality reinforced by the fact that a good few were subject to regular revisions by the composer. Emanuel's own outstanding ability as a keyboard player is also reflected in the concertos, most of which were conceived with players of advanced technique in mind - the sparkling cascades of the soloist's arpeggios in the final movement of the E major Concerto Wq14 come especially to mind. Performing Wq3, Wq6 and Wq14, and bringing to the fore the infectious vitality of these works, is Brilliant Classics regular Pieter-Jan Belder. He is ably supported by his period-performance ensemble Musica Amphion, who under the direction of their soloist draw full attention to the remarkable sophistication and certain amount of unpredictability that characterise CPE Bach's keyboard concertos as a whole.